Hatters skipper Scott Cuthbert was thrilled to be back in the thick of it once more when he was named in the starting line-up at Coventry City last Tuesday. The club captain had been out for more than three months, after badly injuring his groin in the 7-0 thrashing of Cambridge in November. I’m delighted to be back involved with the first team and let’s try and win as many games as we can now. Although he returned against the U’s as a late substitute in the 1-1 draw earlier this month, he was in from the word go at the Ricoh Arena in midweek for the 2-2 draw. On his performance, Cuthbert said: “It was all right, I’m probably going to be really critical of myself when I watch the game back, I always am, but I thought it went okay considering. “I was disappointed with a couple of things, obviously with the goals, there’s always something you can do better. “But all in all I’m fairly happy and I’m just delighted to be back. “I’ve said it before, it’s been a real tough 12 weeks being injured after the operation and having to watch the lads doing so well. Cuthbert was frustrated with the manner of the Sky Blues’ second goal, scored straight from a free kick that the skipper himself had given away. He continued: “I felt I won the ball and he put his backside into me a little bit and bought it. “It’s probably a bit silly from me diving in, probably a bit of frustration. The captain completed his second 90 minutes in quick succession at Newport on Saturday as team-mate Dan Potts said: “It’s testament to him. He’s been out for a long time with a bad, bad injury and he’s played two 90 minutes in four days and he doesn’t look too far off it does he? 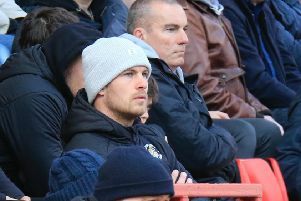 Meanwhile, boss Nathan Jones added: “He’s been a miss for us. He’s our captain, he’s our most aggressive centre-half if you like, in lots of ways. “We were without a lot of players for a long period of time. We’ve named them, five or six we’ve been without and he was one of them.